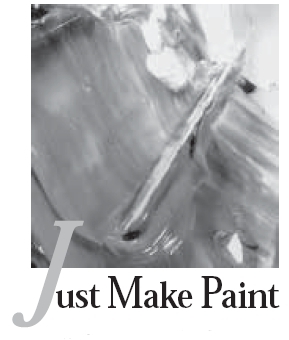 It may seem peculiar for GOLDEN, a manufacturer of acrylic paint products for artists, to feature a Do-It-Yourself Paint (DIY) segment in the JUST PAINT newsletter. However, it makes sense. Our Technical Department frequently receives calls from artists looking for tips for either making or modifying their existing paint. To assist those people, this issue of JUST PAINT can be temporarily renamed – JUST MAKE PAINT. The resources for artists to investigate the formulation and making of their own materials in the studio are scarce. Very few colleges and universities offer ‘Materials and Techniques’ classes anymore. Colleges at one time may have encouraged students to investigate their materials by actually making them, but for many years expression has been emphasized rather than craft. However, as with anything else, things tend to come full circle. Contemporary artists and colleges are more and more concerned about archival issues when they select materials, apply them, and protect their finished works. We can all learn more about these issues from the descriptions, procedures and vocabulary that are addressed in this issue of JUST PAINT. “Homemade” oil paint can be described as being somewhat easy to make in the studio, but 21st century materials are more problematic for the studio technician. To make waterborne paints we will need to understand the ingredients, the procedure and the vocabulary that paintmakers use. The vocabulary presented in our Glossary should be of use to the general creative audience, and not just those with a technical bent. Still, it is comprised of terminology that is from chemistry, physics and industry and may not be as user-friendly as the terms that exist in music or even wine-tasting. Paintmaking is essentially a combination of the sophisticated science of polymer chemistry and the intuition necessary to be a great chef. At GOLDEN, Employees in our Research and Development Lab continuously look for new raw materials to improve the chemistry (“Homemade” oil paint can be described as being somewhat easy to make in the studio, but 21st century materials are more problematic for the studio technician.) of our complex acrylic paint formulas. However, the best raw materials on earth cannot save a poor formula or improve the manufacturing process. Raw materials, particularly pigments, will often vary from batch to batch. The experienced paintmakers at GOLDEN work with the Quality Control Lab to monitor each product’s formula and make adjustments ‘on the fly’ to keep each product within its very tight standards. For our purposes, a successful paint should have certain characteristics. Obviously, the paint should have color and adhere to the surface, however, it should also be durable, lightfast, flexible, and dry properly. It should be relatively safe and satisfactorily perform specific functions it may be formulated for. Shelf stability is also a concern for GOLDEN as a manufacturer, whereas an individual may be more concerned with making paints as they need them and not storing them for long periods. The creation of a paint which is not commercially available, the satisfaction of creating a material to be used from the ground up, or the hope that a serendipitous breakthrough will occur propelling the artwork to greater expressive heights may all be of interest to a studio paintmaker. Let’s take a moment to reflect upon the necessity of employing safe practices when handling raw materials during studio paintmak-ing. Please understand that individuals, in their ardor to create wondrous paints in the studio, must not forsake the responsibilities they have to their own health and the health of those around them. This begins with an understanding of the materials being used and their potential hazards. Raw pigments, for example, can be purchased readily in jars or bags in art supply shops. When purchased in this manner, pigments don’t often come with detailed safety advice. It may be incumbent upon the user to seek more detailed information. This also applies to other raw, often industrial, materials that are ingredients in paintmaking. Start by carefully reading the entire label of each material used. Then request and read the manufacturers’ Material Safety Data Sheets (MSDS) for the products. It may also be appropriate to seek out other sources of health and safety information, such as the well known books of Michael McCann and Monona Rossol; and the ‘Ventilation’ handbook. These are the types of sources that ‘studio alchemists’ must consult to begin to comprehend the nature of the materials that we are discussing and their health implications. Therefore, the first step to studio paintmaking should not be to ask the question, ”where do I get the materials?” or “how do I make a formulation?”. Instead, it must be, “how will I safely use, store, and properly dispose of these materials?” Sobering enough? Well, if you can accept the responsibilities read on – but if not, please leave the paintmaking to us. In short, studio paintmaking makes demands above and beyond those that the painter should already be employing. The basic raw material components of acrylic paint are pigment and binder. Pigment is used in powder form or as a liquid dispersion. Binder, available as liquid acrylic polymer emulsion or a gel, gives the paints their adhesive qualities. The success of a paint relies on its pigment-to-binder ratio. This ratio determines color strength, resistance to marring and surface sheen. For example, too much pigment and too little binder in the formulation might create a paint film with poor cohesion to itself and adhesion to the surface. Too much pigment might also make a lush, ultra-matte finish that looks terrific when freshly applied, but is subject to recording every mar and surface contact. From our standpoint at GOLDEN, we want to optimize the pigment load to acrylic binder ratios. This achieves great color, maximum adhesion, flexibility, durability, and mar resistance of the dried paint film. In addition, we factor in the impact of pigment loading on viscosity, rheology, opacity, transparency, and surface sheen. Also of critical importance, is ensuring that the ratio selected allows for the creation of paint with a smooth, homogeneous workability that maintains itself over time. The proper pigment to binder ratio is usually a function of the type of pigment involved. Inorganic pigments can be used in a higher proportion than organic pigments. For the acrylic paint manufacturer, these ratios are fine-tuned in conjunction with processing and formulating techniques. For the purposes of this article we provide instructions for blending DIY paint based on pigment to dispersion ratios. These apply for either premade or DIY dispersions. The pigment family is comprised of two branches. The first are naturally occurring and synthetically produced mineral compounds referred to as inorganic pigments. These pigments may be mined and refined or manufactured for commercial use. Inorganics have been used for some tens of thousands of years by humankind, most prominently as the earth colors (Ochres, Umbers, Siennas, etc.) and in more recent times as ‘heavy metals” (Cadmiums, Cobalts, Titaniums, etc.). These pigments are characterized by opacity, a broad range of colors and, lamentably, a tendency of creating low chroma mixtures. The second branch of the pigment family are the 20th century pigments developed out of the fossil fuels industry which have hard-to-pronounce chemical names like Quinacridone, Diarylide and Phthalocyanine. These are called synthetic organic pigments and are characterized by their transparency, stained-glass depth of color and incredibly clean color mixes. These colors are unlike anything in the history of lightfast pigments for their intermixing purposes and thus are indispensable to artists. The behavior of these two pigment types will differ in many respects during the paintmaking process. The ability to ‘load’ a color during formulation using an inorganic or an organic pigment is markedly different. Formulas tend to tolerate greater amounts of the inorganic pigments, due to their larger particle size. The result is typically a more matte paint which also demonstrates noticeable opacity. The inorganics can easily be overloaded causing fragility, water sensitivity and embrittlement. The synthetic organics with their lighter, fluffier particles are less able to be loaded into the formulations. This typically results in finished paints which are glossier (more binder shows through) and more transparent. Most pigments don’t like water. They are hydrophobic, having an electrical dissaffinity for water. Pigments do, however, like fats. Linseed oil, which is manufactured from flaxseed, is a fat. Oils and pigments liking each other is the reason why it is easier to make oil paint ‘by hand’ than acrylics. To make a rudimentary oil: assemble pigment, linseed oil, a glass muller for mixing and a nice stone surface and you are off to paint making. Not so with waterborne products, which will require several more steps for a finished, usable product. The DIY acrylic paintmaker may want to simplify this process, at least for some of the more difficult to disperse organic pigments, by starting with premade pigment dispersions. These may be relatively easy to combine with an acrylic gel or medium of the desired viscosity and sheen to create “instant” paint. Just maintain correct dispersion to binder ratios. The binder is vital, providing the adhesive quality, durability and viscosity, or thickness, to the finished paint. Acrylic binder is available as either a liquid (GOLDEN Polymer Medium or GOLDEN Special Purpose Polymers) or gel (GOLDEN Soft Gel, Extra Heavy Gel, etc). Acrylic painters are typically familiar with the “white” quality of wet acrylic. This whiteness, an optical effect, abates with the evaporation of the acrylic emul-sion’s water component. The whiteness is replaced with a relatively transparent appearance in the dry phase. After drying, the mediums and gels are typically glossy unless flattening agents have been added. Selection of an appropriate binder will depend upon the rheology, viscosity, sheen, flexibility, film thickness, and hardness of the desired paint. A variety of additives are necessary to make an artist’s grade acrylic. Among them are thickeners, preservative, dispersants, anti-foamers and pH stabilizers. These materials are used in very small amounts and it is necessary to add them precisely to optimize their effectiveness without damaging the paint by using too much. Be prepared before starting your first batch of paint! Here’s a quick checklist for would-be paintmakers. The working area to produce your paint should be clean, have adequate ventilation, running water, lots of counter space, tool drawers, and shelves to keep your materials organized. o Containers: Container size will depend upon the desired batch size (See Note: How much should I make?) Containers should be either plastic or stainless steel. To facilitate mixing, containers should have straight sides and a flat bottom. o Storage Jars with tight fitting lids. It’s handy to reuse GOLDEN HDPE (High Density Polyethylene) paint jars for this purpose. Simply peel out the dried skin after letting the old paint residue dry thoroughly. Note: How Much Paint Should I Make? Ultimately, as much as you want, but first we strongly suggest that you start with small batch sizes. If you’ve never hand-ground pigment before, start by making a dispersion with just a few grams of pigment, as you may choose to avoid some of those that are more difficult to disperse. Also, it is not uncommon to accidentally ruin a batch of paint, especially when attempting the more complex formulations. Practicing on small batch sizes will minimize waste should something go awry. Some pigments, like Ultramarine Blue, certain iron oxides and mixed metal oxide pigments, disperse very easily. These can be made on a DIY basis with little or no mechanical help. Others, such as Quinacridones, Phthalos, Dioxazine Purple, Anthraquinone Blue and Vat Orange are very difficult to disperse into water-borne systems, and require substantial mechanical dispersion. In a paint factory, this is accomplished with various types of paint mills. DIY dispersions made from these difficult dry pigments will need to be hand-ground, using a glass muller and plate. This is a very time-consuming process when it is done right. In addition to pigment, you will need GOLDEN Universal Dispersant and Defoamer. Universal Dispersant contains a complex combination of surfactants (also common in soaps and detergents). Pigments will typically repel water, making them difficult to blend. Universal Dispersant is used to “wet out” dry pigments. It causes them to easily and finely disperse and allows them to remain stable in waterborne acrylic paints. To start, it is best to know the weight of the pigment you will be using. Begin with a 1:1 ratio (by weight), of Universal Dispersant to pigment. Pour the Universal Dispersant into the mixing container. Slowly add the pigment into the Universal Dispersant while thoroughly stirring the mixture with a spatula until it forms a creamy paste. Add more Universal Dispersant during this process, as needed, to maintain the paste consistency. The amount of Universal Dispersant required will largely depend upon the type of pigment being used. Pigments should generally fall within the range of 1:1 – 4:1 parts by weight of Universal Dispersant to pigment. If using the variable speed drill with a paint stirring bit for this task, mix slowly at first, then faster, to achieve a smooth, homogenized mixture. Finally, slowly add GOLDEN Defoamer (up to 1% of the final mix, by weight) and mix thoroughly. The Defoamer acts to counteract the suds that are generated from mixing up the surfactants in the Universal Dispersant. If the mixture has obvious grittiness (difficult to disperse pigments), or for greater color development of almost all pigments, place the dispersion on a glass surface and use a glass muller to grind it. The more you grind, the more color strength will be developed. At the least, all grittiness should be ground out. The pigment dispersion is then ready to blend into the acrylic binder. Once the dispersion is ready, your binder choices may seem endless. For simpler formulations, any of the GOLDEN Mediums, Gels and Molding Pastes may be appropriate. Select the one that will give your paint the desired sheen, viscosity and rheology. When doing this, it is important to keep the intended application of the paint you wish to create in mind. For a Heavy Body-style paint, you may choose one of the GOLDEN Extra Heavy Gels (Gloss, Semi-Gloss or Matte). An Extra Heavy Gel is used to compensate for the thinness of the pigment dispersion. To make paint that is thinner than GOLDEN Heavy Body Paints, for smooth brush applications, use the more fluid acrylic mediums such as GOLDEN Soft Gel, Polymer Medium (Gloss), Matte Medium, or Fluid Matte Medium. To make thicker paint, for brush or palette knife applications, use the thicker acrylic binders such as GOLDEN Heavy Gel, Extra Heavy Gel, High Solid Gel or Molding Paste. High Solid Gels are useful for making thick paints that will not shrink as much when they dry. Use the GOLDEN Molding Pastes if you want to increase the paint’s opacity, as the Molding Pastes contain solids such as marble dust and chalk that are white or gray, by nature. However, the Molding Pastes will tint the color. Start with a dispersion to binder ratio of 1:1 (by weight). Thoroughly blend the pigment dispersion into the medium. Use the spatula first. For larger batches, finish with an electric drill or other mechanical mixer at a low speed. The paint will become homogenous and buttery, like a GOLDEN Heavy Body Acrylic color, which has the same body as a GOLDEN Regular Gel. Higher percentages of binder will allow your color to be more transparent. If you are intending to spray your color, mix 1 part dispersion to 6 parts GOLDEN Transparent Airbrush Extender or Airbrush Medium. Poorly ground pigment particles, however, will cause severe clogging of the gun. This option is for the artist who desires to acquire the ultimate control (or lack of control) of their media. CAUTION: This option requires more sophisticated measuring and processing techniques. As the DIY paintmaker gains knowledge and experience the chance of success will dramatically increase. For example, use GAC 900, for making paints that are appropriate for achieving a “soft hand” in garment applications. GAC 900 becomes more permanent when it is heat set, allowing successful laundering. Use GAC 800 for pouring paint to form pools or for paint applications over chalky surfaces. It levels well and minimizes the crazes or cracks that may develop in the film when the acrylic binder dries. Use GAC 200 in combination with the other binders to make a harder paint film that has greater adhesion to slick surfaces. More information about the uses of the GAC’s is available on our website, www.goldenpaints.com, or contact GOLDEN for a technical information sheet. The first stage of modifying a GAC Special Purpose Polymer includes using additives to balance the pH, control foam, and determine the surface sheen. The second stage is using more additives to modify the viscosity (thickness) and rheology (flow). Additives affect the stability and working properties of the acrylic polymer binder, and hence, the paint. They have no binding or color qualities. The degree of acidity or alkalinity of a solution, known as pH, is measured from 0 to 14. Acid solutions measure 0 to 7. Alkaline (smells like ammonia) solutions measure 7 to 14. Pure distilled water measures 7. There are instruments to measure pH, or you can rely on sense of smell. The binder should have a slight ammonia odor. We are shooting for a pH range of 8.0 to 8.8. The acrylic polymer used to make paint becomes unstable at a pH below 7.5. The acrylic binders described in this article fall within the correct range. However, adding a dispersion may lower the pH below the optimum range. Also, adding thickeners will typically lower the pH. If your polymer binder starts looking and acting like cottage cheese then chances are your pH is too low. Try raising the pH to salvage the batch. Do this with the drop-wise addition of Ammonium Hydroxide (NH4OH) while mixing. This is available at grocery stores as ammonia. It should be an unscented, non-sudsing variety. If the mixture does not respond to the pH correction, allow it to dry out for disposal. 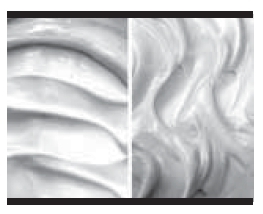 During the manufacturing process, the surfactants in acrylic paint formulas generate foam. Defoamers are usually mineral oils or silicones that are not compatible with the waterborne acrylic polymer formula. Defoamers seek out air bubbles and pop them to relieve stress. However, only very small amounts of defoamer are necessary. Add defoamer slowly while mixing. Do not exceed 1% of the total batch size. Overuse of defoamers will cause major problems such as “fish eyes” and craters, particularly with thinner paints. GOLDEN offers two Defoamers; GOLDEN Heavy Body Defoamer for full-bodied acrylic paints, and GOLDEN Fluid Defoamer for thinner acrylic paints. Besides adding defoamers to formulas, many products manufactured at GOLDEN are also processed mechanically to remove foam and impart a smooth, creamy feel. Therefore you may have to accept more foam in homemade formulations. Viscosity will affect the amount of foam a mixture retains. Thinner paints will release foam over time or a bit more quickly if one gently taps the bottom of the closed paint container on a counter top. Matting agents are common raw materials used in the manufacturing process of paints. They reduce the surface sheen (and tackiness) of the dry film. Matting agents cause little bumps and ruts on the paint surface. These aberrations sporadically reflect the light hitting the paint surface, creating a matte finish. GOLDEN has two types of matting agents: Amorphous and Crystalline. Amorphous is synthetic. It is produced to yield a very pure, amorphous, highly porous silica. It is white and will have a slight affect on your color. Crystalline is mined from the earth and refined. It is more transparent than amorphous matting agents and has a greater degree of matting capability. It is slightly gray and has only a little affect on your final paint color. Typically, it is a little easier to work this matting agent into your paint formula.If you are looking for a really matte paint, try using GOLDEN Super Loaded Matte Medium with your dispersion, instead of powdered matting agents. You can thicken it up later. This medium has a high concentration of crystalline matting agents in an aqueous state and reduces your exposure to nasty airborne silicas. Airborne crystalline silica is a potential human carcinogen. If you insist on using dry, powdered matting agents, please handle carefully and use a NIOSH approved respirator suitable for toxic dusts. Make sure to wipe all surfaces with a wet cloth to remove any dusts after mixing. Mix the matting agents with water or Universal Dispersant before thoroughly stirring them into the binder. Even distribution of the matting agents is essential. For larger batches, use the variable speed drill and paint bit. To produce a full-bodied, buttery color use GOLDEN Liquid Thickener (Short Rheology). For a more resinous paint, use the Long Rheology version. Dilute the thickener with an equal amount of water. Add a few drops at a time to the binder or binder/dispersion mixture, and mix about 1 – 2 minutes before adding more drops. For best results, use a mechanical mixer for larger batches, such as a variable speed drill. You will also need to add household ammonia to maintain the pH in the acceptable range. Ideally, this is determined with a pH meter, and is characterized by a slight ammonia odor. You will feel the mixture get thicker as you proceed. (If you are getting chunks it may be a result of adding the Thickeners too quickly or insufficient mixing.) Blend until the mixture is smooth and of the desired thickness. To create an acrylic stain, it is most useful to start with a low viscosity paint (DIY or factory made). This is then mixed with water (preferably distilled) at a ratio of at least 5-10 parts water to one part paint. 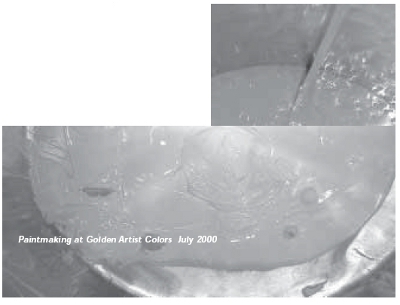 GOLDEN Acrylic Flow Releasemay be used to increase the flow properties of the stain. Flow Release is a surfactant and works by reducing the surface tension of the water in the mixture, thereby improving wetting of the surface to which it is applied. Dilute before use by mixing 1 part Acrylic Flow Release to 10 parts water. Slowly add small amounts of this mixture to your paint and water stain. Increase levels gradually. Excessive use of Flow Release will cause water sensitivity of the paint film and film tackiness. All GOLDEN Gels and Special Purpose Polymers; and GOLDEN Universal Dispersant are formulated with enough preservative to protect most DIY paints we’ve discussed . However, If you intend to make paint that will have a high percentage of water in the formula, such as a transparent acrylic stain, consider adding GOLDEN Liquid Preservative to inhibit microbial growth. Stain mixtures are easily contaminated with tools or from just being left open. Mold, mildew and scum will likely appear when these stain mixtures are stored for a while. Add 1 fluid ounce (30 ml) of preservative to each quart (950 ml) of stain mixture. It is a good idea to keep the pH over 8.0, as well. Acrylics are famous for their wonderful, quick drying properties. They can easily be worked over, making the painting time much shorter than painting with oils. This is fine for some artists, but, what if you want to slow the process down to work outside on a breezy day? For DIY binder, add a small amount of GOLDEN Retarder (no more than 15%) to the binder before you thicken it with GOLDEN Liquid Thickeners. You can also add Retarder to existing GOLDEN Gels and Mediums, before doing your final blend with your DIY pigment dispersion. Retarder evaporates at a slower rate than the water present in the acrylic formula. Be careful of overuse. It will cause the film to remain tacky or never completely dry. GOLDEN Acrylic Glazing Liquid, unlike Retarder, has binding properties and is an ideal choice for making slow-drying acrylic glazes. The glazes are useful for controlling multiple glaze applications over underpaintings to develop rich, deep, transparent colors typically achieved by the “Old Masters”. DIY acrylic glazes can also be used by artists working in the Decorative Arts for “subtractive” decorative techniques on interior walls. To create slower drying paints, modify your mixture with GOLDEN Acrylic Glazing Liquid, or small amounts of Retarder. We hope you thoroughly enjoy any paintmaking experience you choose to embark upon. We’ll leave you with just a couple more pieces of advice. First, keep fairly detailed records of your work. This involves labeling each jar of paint with the color and a batch number that cross-references to an account of the identity, source, and amounts of raw materials used in the formula. This will be an important reference as you work to duplicate or improve formulas, to address any future environmental or health questions that may arise, or simply for the sake of posterity. Second, once the paint has been completed, test it before actual use. Examine the film closely and look for large particles, pinholes, cracks or other defects. Wet a paper towel and gently wipe the surface to evaluate the paints’ water sensitivity. Compare this to factory-made paint as an indication of the relative quality of the grind and pigment to binder ratio. Apply the paint to a flexible support, allow it to dry and bend it over the edge of a table or dowel to see if it cracks. Unless you’re trying to make a very hard paint for rigid supports, it shouldn’t. Does the dried paint film seem to be tackier than factory-made paint? Brush the paint onto a piece of HDPE plastic (like a GOLDEN jar), allow it to dry and peel it off. Slowly stretch this “free” paint film. It should elongate before gradually tearing or breaking. If you experience any difficulties, reread this article for clues as to what might have gone wrong. If you need help, please feel free to call our Technical Department.